A box is a many splendored thing. At my house, we love boxes. Boxes aren’t just for cats. Many years ago, I remember my parents bringing home a new refrigerator. I don’t remember how old I was, but I do remember the excitement of us kids when we saw the size of the box. The things we could do with it! That box was so big we used it as a tunnel to the entrance for our house… until Dad decided it needed to go. We only had it for a few hours, but what fun we had with it. 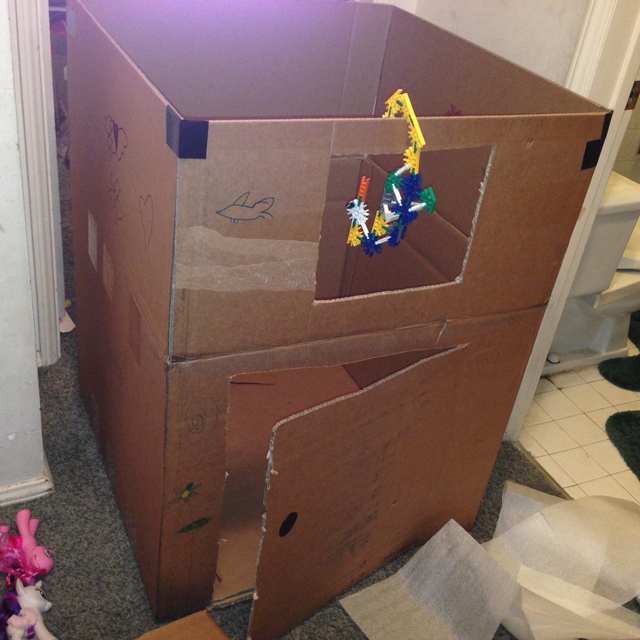 The other day, Charlie brought home some boxes–large boxes, boxes that are perfect for making something more than just a box. 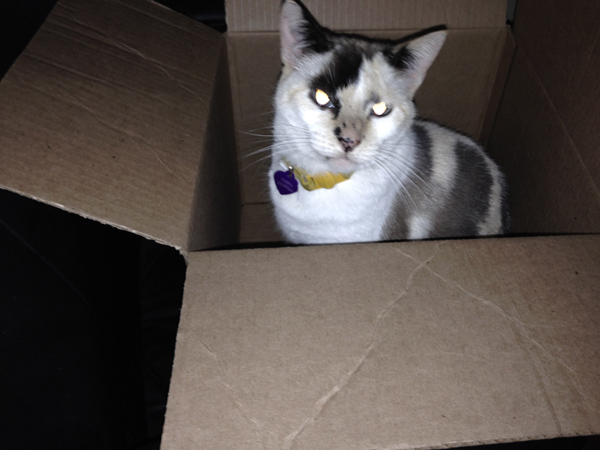 When Lily saw the boxes, her eyes lit up. The possibilities of what she could do with them forming in that fertile imagination of hers. Of course, they were full of something Charlie was excited about, and while Lily was excited about that, too, I knew which of the two would have a longer staying power. Since the boxes are big enough, and there were enough of them to overflow our recycle bin, we agreed to allow her to make something out of them. Oh, she couldn’t wait to invite her friends over. Charlie and I cut out doors and windows for them with a box cutter. They, though, are the ones who made the shelves and decorated. They spent hours playing in it/working on it. It’s not done, either. They have one or two more large boxes, and they plan to make an entire house out of it (a living room, two bedrooms, and I’m not sure what else. As long as it’s not a bathroom, we are good. LOL) Honestly, if I were small enough, I’d go in them, too. LOL I love boxes. You may notice that Lily has added shelves for “storage.” True to the nature of cats, one of them has found a shelf in her bedroom. 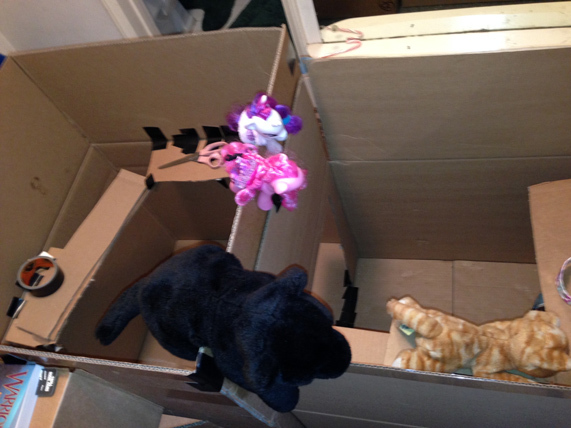 She’s nearly depleted our duct tape, and her My Little Ponies are peeping over into the bedroom. I guess our family is full of members who love boxes. What about you? Are you a box lover, too? Do you see the endless possibilities when you look at a box? Or do you just prefer to chuck them? Oh, I hate to dispose of boxes of any size. One never knows what can be done with them! lol Awesome work on the “house” by Lily and her friends. It’s fun to play with, but I will be ready to let them go as they are in the middle of our very tiny hall. It’s kind of like a Christmas tree. It’s fun while it’s up, but it’s nice to get the space back.